We are in the process of building a new site! 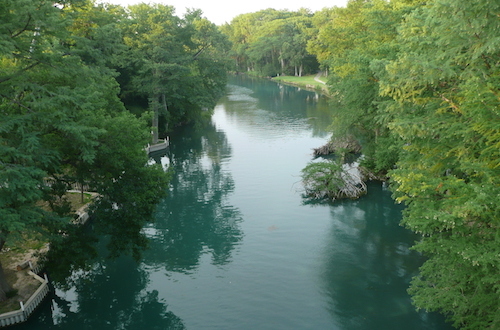 You'll discover exciting things to do as our guest at the River Ranch RV Resort in beautiful New Braunfels, Texas. 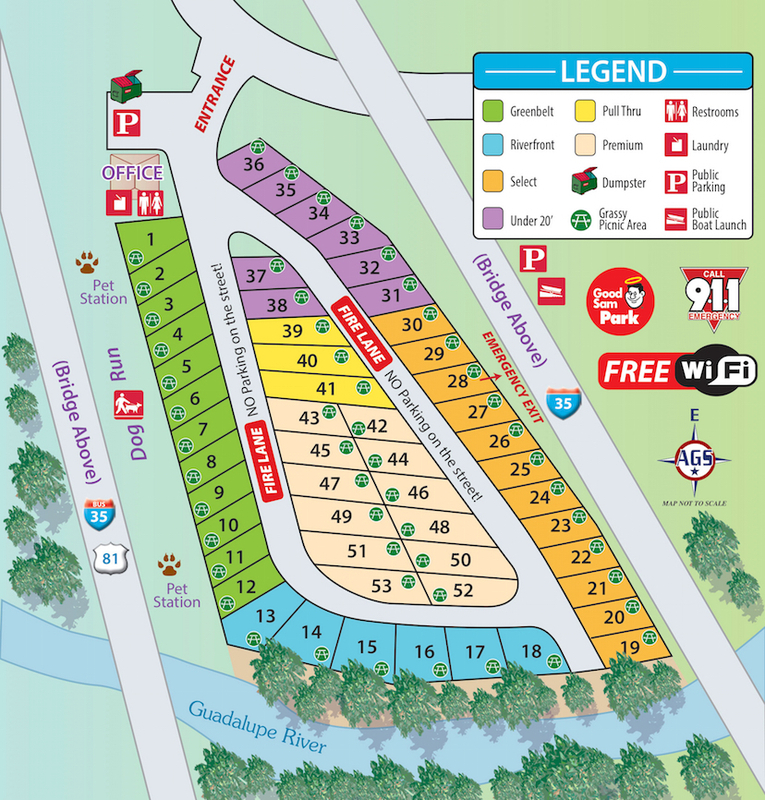 Our Hill Country campground, located between San Antonio and Austin, is near every attraction in central Texas. We are Good Sam members and Woodall's rates us with 5 stars! Call (830) 625-7788 to reserve your site today! Call (830) 625-7788 to reserve your site. The difference between the sites is the length. All sites are 30 to 35 ft wide. Select sites will accommodate rigs up to 34 ft in length. 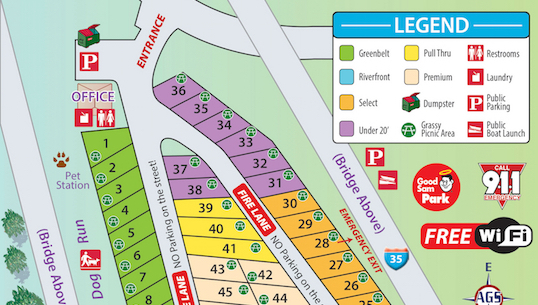 Greenbelt sites will accommodate motorhomes up to 40 ft, trailers and 5th wheels up to 38 ft. Premium sites will accommodate rigs 36 ft to 50 ft in length. River front will accommodate rigs up to 50 ft in length. All of the above are back-in sites. Pull-thru sites are available for RV's up to 55 ft.
River Ranch RV Resort is Open Year Round! Holiday rates (3 night minimum) and Wurstfest rates (2 night minimum) are an additional non-refundable $10 per night. We offer discounts for Good Sam, Taco, Military (active and retired), Police, and Firefighters on all our daily rates. We now accept Passport America based on availability of selected sites. Passport American discounts are available year-round Sunday through Thursday on daily rates only. PA rates do not apply to any of the riverfront sites and are not valid during Memorial Day, Fourth of July and Labor Day holidays or during Wurstfest. Online reservations are not accepted for PA. Phone reservations accepted up to 3 days prior to arrival date. All rates subject to change without notice. All reservations made for future year are subject to increase. A dog walking area is available. When outside the RV, pets must be on a leash no longer than 8 foot and may not be left unattended. Please be kind to your neighbors - always clean up after your pets and keep barking at a minimum. Pet cages, pet pens and tie outs are not allowed. Sorry, No Aggressive dogs at the resort. Breeds not permitted include Pit Bulls, Rottweiler's, and Dobermans. Please call for more information. River Ranch RV Resort offers daily and weekly reservations online or by phone. Groups are welcome. Please call the resort for more information. No discounts for holidays, weekly and monthly rates. Rates are based on 2 guests - $5.00 additional person 8 years and under/day - $10.00 additional person over 8 years/day with a maximum of 6 people per RV. All RV's must be in good condition. Please call in advance for approval of RVs older than 10 years and for additional information. Please, no golf carts, bicycles, skateboards, roller-skates, hover boards, scooters or ATV's. Over 30 sites available for big rigs! Our rates are for 1 vehicle per site. Riverfront site rates include 2 vehicles. $10.00 additional vehicle rate per day. 50% cancellation fee applies to all cancellations prior to 72 hours of the arrival date. If the reservation is cancelled less than 72 hours, then the first nights fee is charged. © River Ranch RV Resort 2018 All right reserved.